The VMC® Sport circle hook is forged from extremely tough and lightweight Vanadium® Steel. It offers up to 25% increased strength over the material used in regular hooks. Perfect for rigging live bait in both fresh- and saltwater, its unique strength and sharpness withstands even the strongest braided lines. 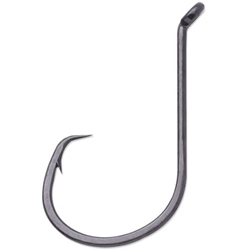 The bend out eye allows you to snell this hook easily. THE BIGGEST THING IN SALTWATER HOOKS IS ACTUALLY MICRO THIN. Imagine a hook made specifically for saltwater with built-up layers of ultra-thin black finish to withstand the harsh conditions of the saltwater environment. Introducing the COASTAL BLACK™ series from VMC. High corrosion-resistance for the longest-lasting black finish in the saltwater market with ultra-sharp, multi-step chemical sharpened hooks. Such a big advancement, all the fish in the sea will be hooked on it.